Much like fertilizer, I've been waiting (im)patiently for a pullback in the natural gas group. I was a bit skeptical of the early move, so it took me some time to begin to "believe" and I created 2 positions a month later [Mar 17: Beginning First Natural Gas Play - Cabot Oil & Gas (COG)] and [Mar 19: Second Natural Gas Play - EOG Resources (EOG)] I have only had about a 2% stake with these 2 combined so I believe I really missed the boat on this one. Since then I've been waiting for this pullback than never arrives. I'm still wondering what exactly is driving this group - my guess back in February was perhaps as some coal companies are moving from 10% of production for export to 30%, that is leaving less "energy resources" in the US, which natural gas is coming in to fill the "relative shortage"; coal being much easier to transport overseas. Or it could just be tracking up with the massive move in crude. 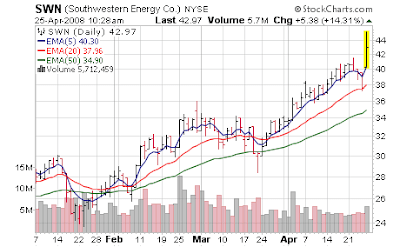 Either way, with results like this from Southwestern Energy (SWN) - you just have to sit back and applaud. Southwestern Energy Co's (SWN) quarterly profit more than doubled, beating Wall Street expectations, helped by an increase in production and higher realized natural gas prices. The company raised its second-quarter natural gas and oil production outlook. For the first quarter, the company reported net income of $109 million, or 31 cents a share, compared with $51 million, or 15 cents a share, a year ago. Analysts on average were expecting earnings of 25 cents a share, before items, according to Reuters Estimates. Gas and oil production rose 71 percent to 39.1 billion cubic feet of natural gas equivalent (Bcfe). Average realized oil price was $96.55 per barrel, compared with $55.17 per barrel in the year-ago quarter. The company raised its second-quarter natural gas and oil production outlook to 41.5 to 42.5 Bcfe, up from 36.0 to 37.0 Bcfe.